We all love Thanksgiving, but what we love even more is the leftovers. This leftover Turkey Sandwich is the ultimate way of enjoying every bit of those tasty Thanksgiving leftovers. If you don’t have any more turkey leftovers, this sandwich can easily be made with turkey deli meat or leftover rotisserie chicken as well. Here are a few more ways to use up any other leftovers from your Thanksgiving feast. This post has Amazon affiliate links for tools we used to make this recipe. Spread the ranch onto 1 side of all the sourdough bread slices. 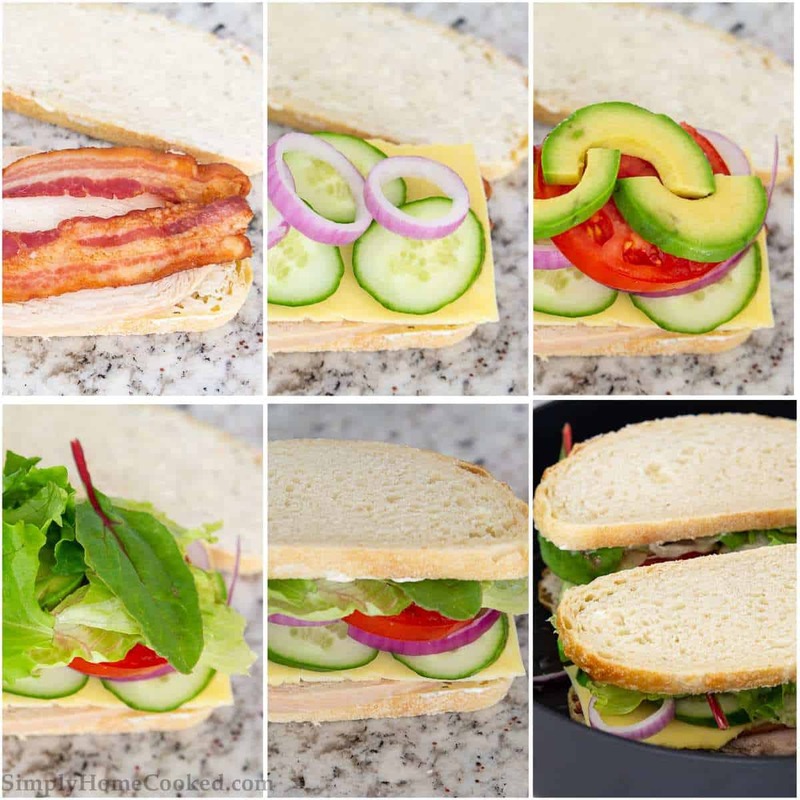 Then begin assembling the sandwich in this order: bread slice, turkey breast, bacon, Havarti cheese, cucumber, red onion, tomatoes, avocado, and spring salad mix. Then top with the other bread slice ranch side down. In a skillet with hot olive oil, cook the leftover turkey sandwich on both sides until the bread is golden brown. This step is optional but I love the crunchiness of a panini. 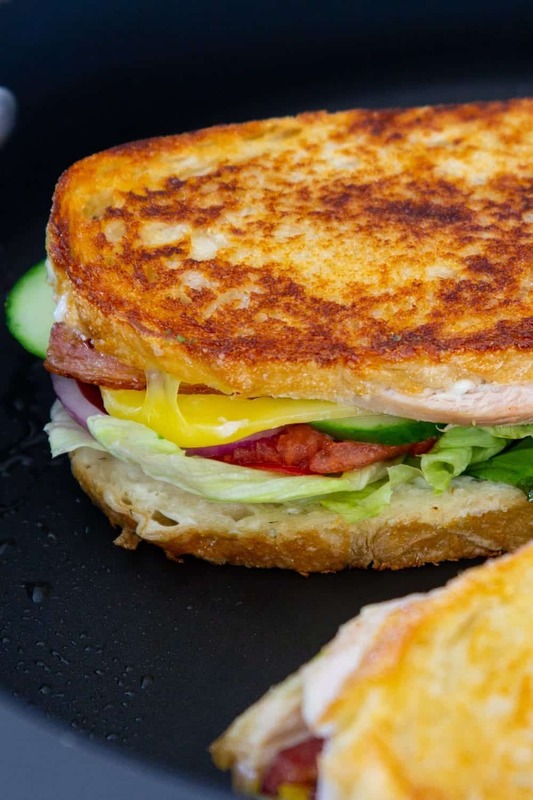 You can also make this turkey sandwich in a panini press. If you love sandwiches you might also like to try these sandwich recipes. The ultimate leftover turkey sandwich! You'll look forward to Thanksgiving leftovers even more after giving this sandwich a try. Spread the ranch dressing on one side of all 4 pieces of sourdough bread. 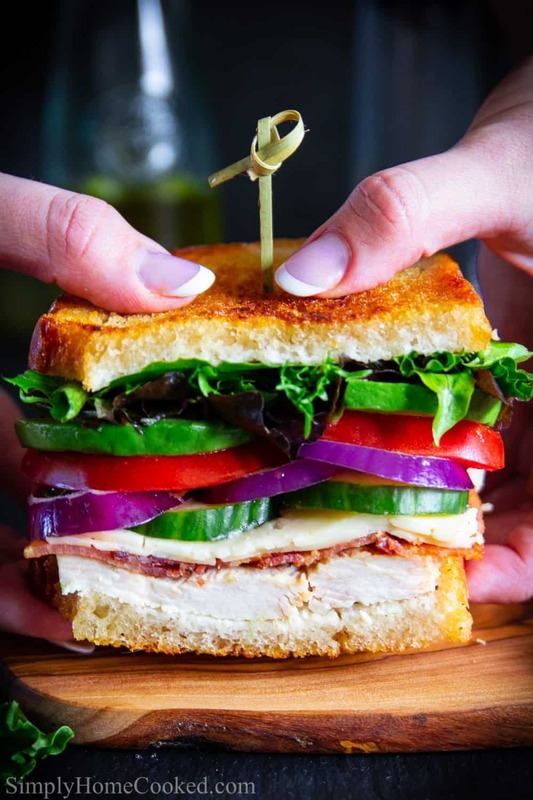 On two slices add the turkey breast, bacon, Havarti cheese, cucumber, red onion, tomatoes, avocado, and spring salad mix. Then place the other two bread slices on top ranch side down. Heat olive oil in a skillet on medium heat and cook the sandwich on both sides until the bread is golden brown. This looks sooo good! Funny thing my sister said “it looks too colorful, too good!” , because it is!